With an unexpected diagnosis of Gluten Allergies, we quickly changed the menu in my home for my daughter. If you are keeping up with all the details I have one Vegetarian, one with loads of food allergies and now another with Gluten Allergies. 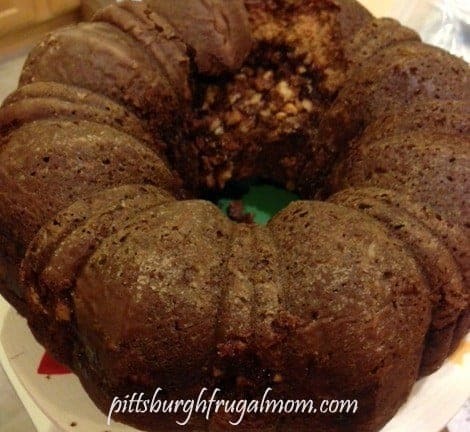 Here’s a great recipe for Gluten Free Walnut Coffee Cake. I don’t want my daughter to feel isolated from the world of food and initially it was hard to even find the ingredients we needed. We traveled to Walmart and found more offerings than any other store, and of course we spent a great deal of time in Whole Foods. What she craved was variety and things that WE were eating, so I lavishly lived food out loud and took o the challenge, creating a cake she could eat and it is super easy to make! The key to a bundt cake is of course a pan that does not allow it to fall apart, my favorite pan is featured below, I love how it releases. Bundt Cake Tip: Let the Cake Cool Completely Inverted on a Baking Rack and place a paper towel(that you will change as it absorbs moisture) completely. After a few hours when the pan is totally cool to touch, go ahead and get that cake out of there, it is will literally pop out on its own when it is cool. In a separate mixing bowl, mix the flour, baking soda, baking powder together. In another bowl mix eggs, and butter and sugar. Mix until very creamy consistency. Add Vanilla and sour cream and continue to stir. Once smooth, add the flour(gf) mix and mix just until mixed together, do not over mix. In an additional bowl, mix the filling with a fork. Make sure to spray a pan(bundt) for the batter. Add 1/2 the batter to the pan, it will be thick, smear with a spatula. Sprinkle with nut filling and then add the rest of the batter. Bake on 400 for 45 minutes or until a toothpick comes out clean! As you can see it is not hard to prepare this cake, it just took a bit of ingenuity to reinvent the recipe. You too can lavishly live gluten free foods out loud and prepare this walnut bundt cake, as it is an easy to prepare recipe. Of course if you don’t have time to make your bundt cake from scratch, here is one you might try out, taking a bit less effort but producing some good results.